Losing significant amounts of weight can be hard, especially if you just rely on exercise and dieting. If you want to take your weight loss to overdrive, you shouldn't miss out on the fat-burning powers of L-Carnitine. 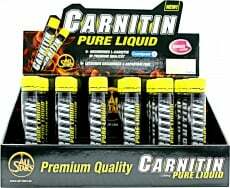 Get your daily dose of highly absorbable liquid L-Carnitine with a vial of All Stars Carnitin Pure Liquid! Activate your body's fat-burning facilities! Turn all those unwanted fats into precious energy by taking you daily dose of All Stars Carnitin Pure Liquid! Have a question about Carnitin Pure Liquid? What is it, what does it do, how and when to use or something else? Ask us. “Carnitin Pure Liquid 18 vials” is currently out of stock. Enter your details below and we will let you know when it's back in stock. Shake well before use. Drink 1 vial daily, diluted with water (about 250ml), preferably with breakfast or before training. WARNINGS Carnitin Pure Liquid : Do not exceed recommended daily dosage! Keep out of the reach of children! Dietary supplements should not replace a balanced and varied diet and a healthy lifestyle!